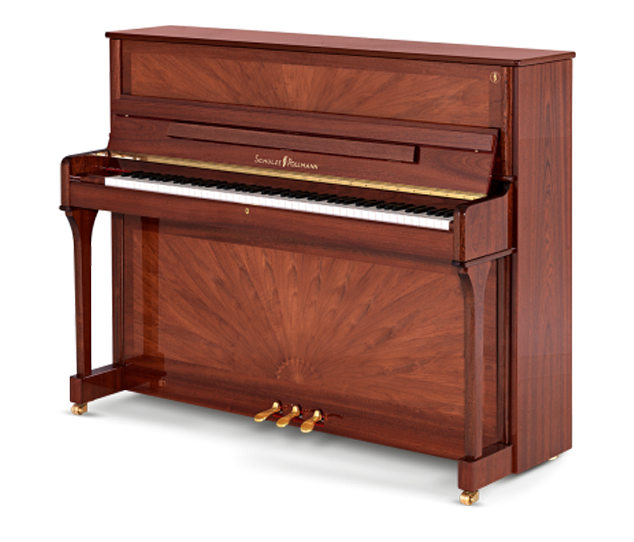 How would you like to have an exceptional European upright piano without completely breaking the bank? 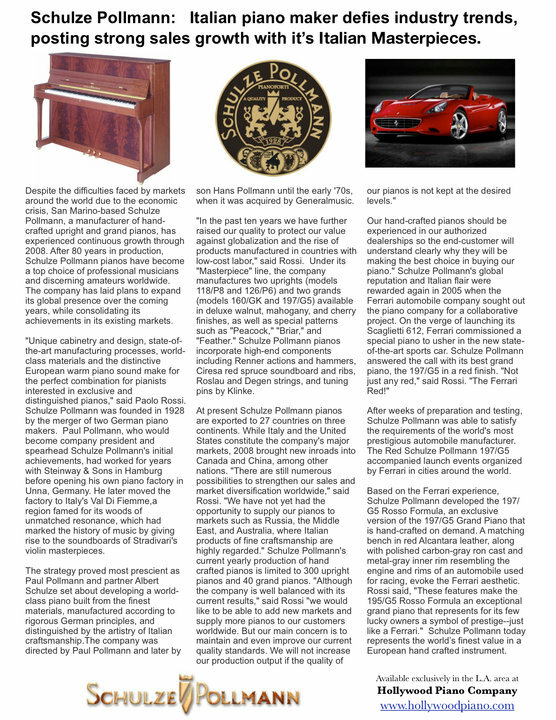 We believe we’ve already assembled the best line of uprights in the industry on a price-performance basis, and are pleased to offer what we believe is the Ferrari of handbuilt, quality upright pianos: the Schultze Pollmann pianos. 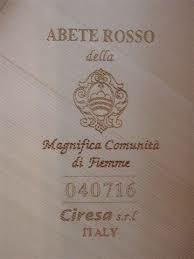 In fact Ferrari commissioned their fellow Italian company to make pianos in Ferrari Red to be sent to Ferrari showrooms all over the world. Recognizing the exceptional hand built qualities of Schulze Pullmann made Farrari interested in collaboration with them. 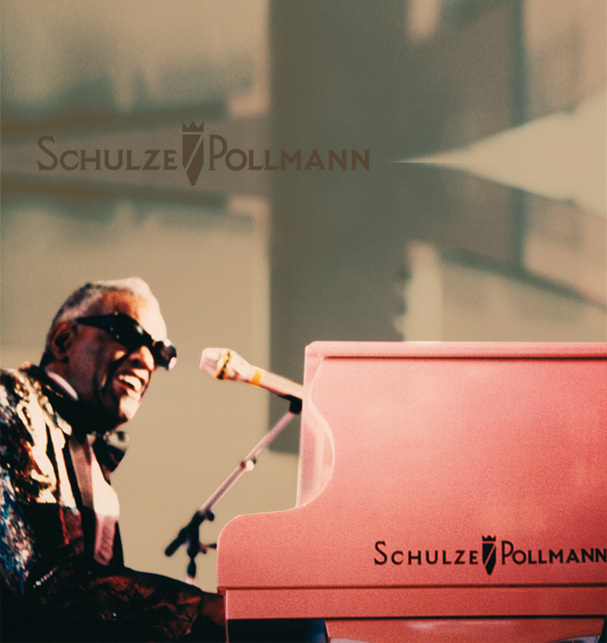 Schulze Pollmann was founded in 1928 by the merger of two German piano makers that relocated to Italy. The new company was named after its two founders, Paul Pollmann and Albert Schulze, and was located in Italy’s Val Di Fiemme region, which is famed for its wood used by Antonio Stradivari in his world famous violins. That same wood is used in many Schulze Pollmann soundboards producing the warm sweet sound the brand is famous for. Today, Schulze Pollman is located in the tiny Republic of San Marino, which is in central Italy, and is the only Italian manufacturer of both upright and grand pianos. 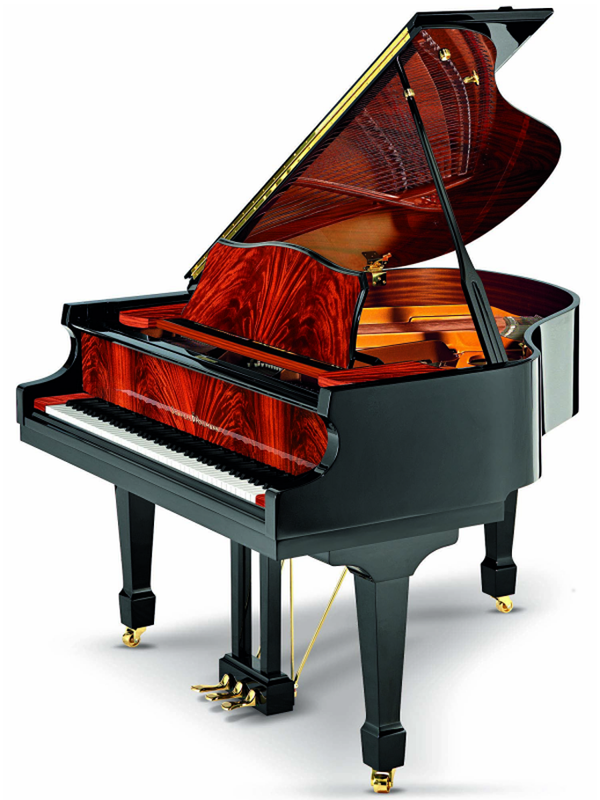 Fazioli, the other Italian piano manufacturer, is known for its grand pianos. Artists from all over the world have admired and played on Schulze Pullman pianos. Its "Masterpice" uprights and grands have absolutely gorgeous cabinets that compare to any being made in the world today. Their red spruce soundboards and ribs come from Val Di Fiemme and are made by world-renown Ciresa, while their actions and hammers are made by Renner, strings by Roslau and Degen, and pins by Klinke. 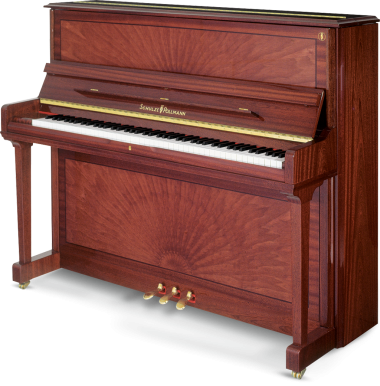 The pianos are rated as Performance Grade by Larry Fine and are known for their warm "European" sound. To our mind, the Schulze Pollman uprights compare with any that are being made in the world today, but less expensive than its more well-known Performance Grade competitors. The 197 grand piano is so beautiful on the inside it was featured at the museum of art in Milan. 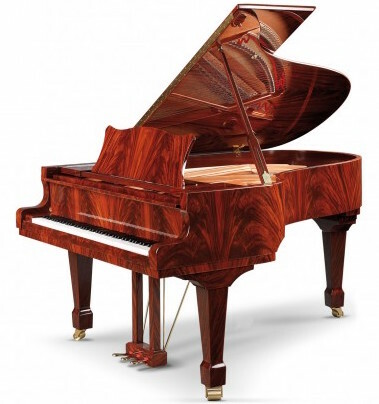 If you are looking for an exquisite piano that looks beautiful and has a sound that matches and exceeds other European pianos, come hear our Schulze Pullmanns. price. The model 122 features soundboards and ribs of the red spruce from Val Di Femme used by Stradivarius in his violins and made by world-renown Ciresa as in the Masterpiece series. 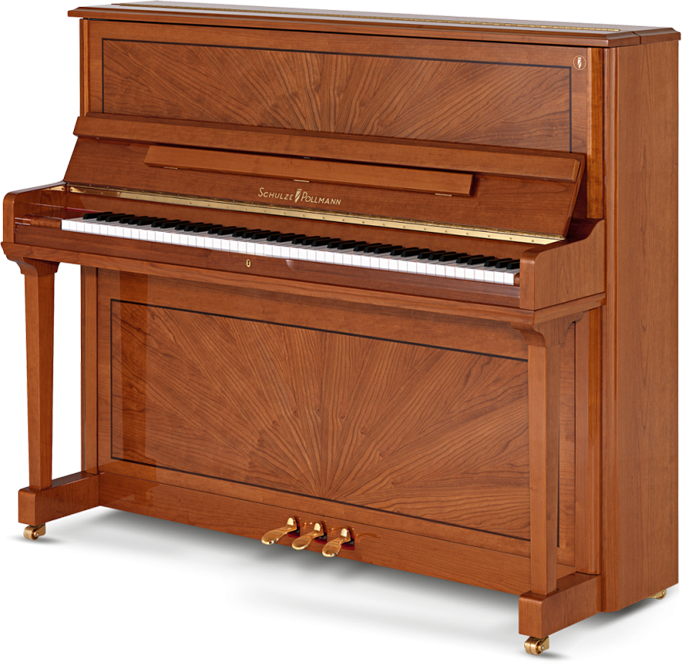 The only other pianos made today using this same wood exclusively is the Italian made Fazioli piano, one of the most expensive in the world. 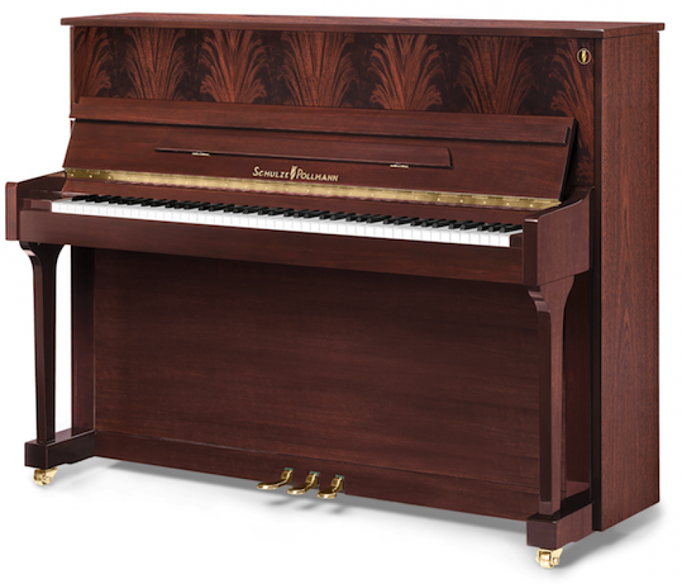 We believe strongly that the Schulze Pollmann pianos are another example of a piano on top of our price/value curve. 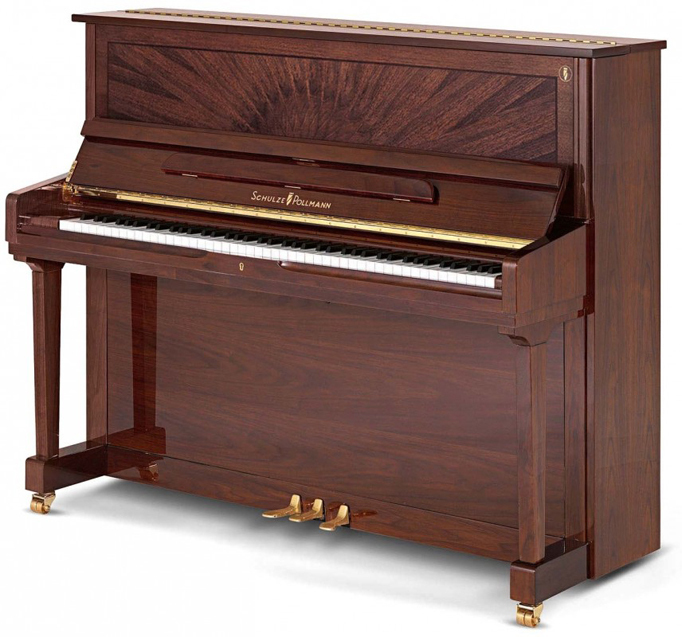 Extreme Value - For substantially less cost than similar hand crafted pianos from Germany, Schulze Pollman offers a high quality European made piano and with high style. 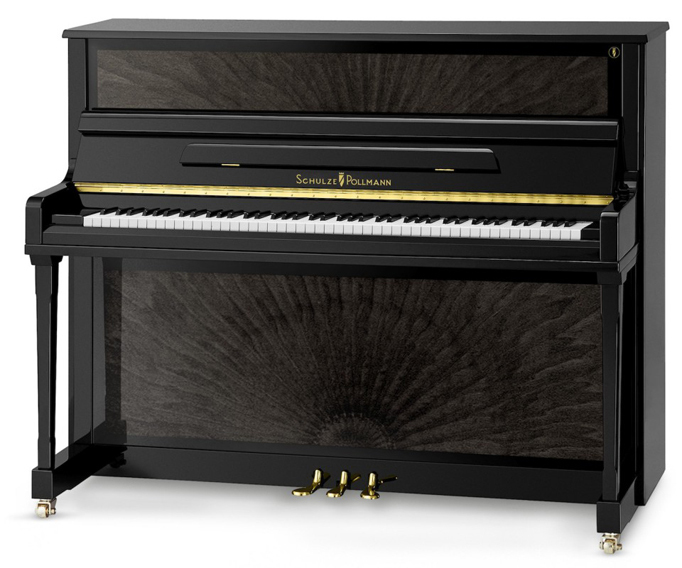 Warm Round Singing Tone - Schulze Pollmann pianos posses a unique warm singing tone ideal for the full range of classical repertoire. 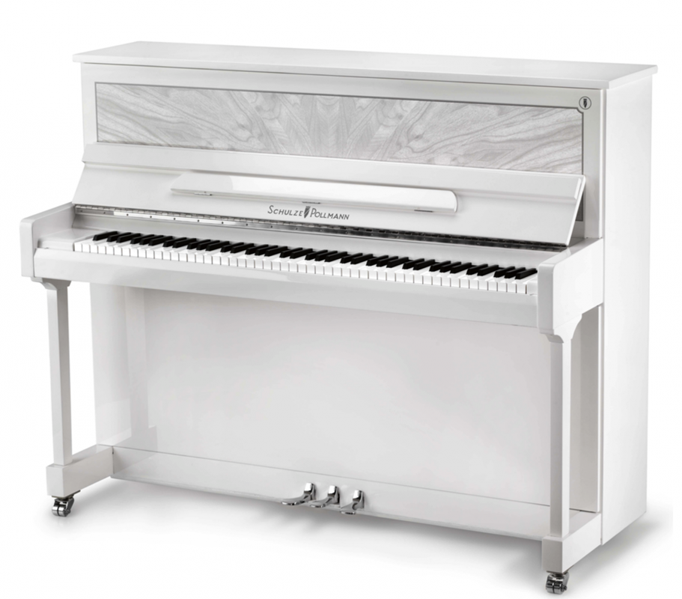 Renner Actions - All masterpiece series pianos feature German Renner actions. 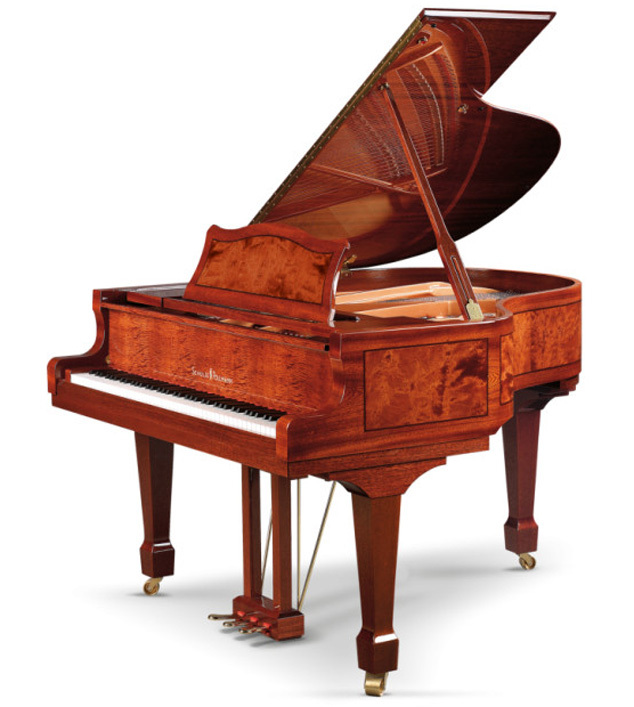 Standard in many of the world's finest pianos. Ciresa Soundboards - Most Schulze Pollmann pianos feature red spruce soundboards and ribs from the Val Di Fiemme where Stradivarius chose the wood for his famous violins. individual works of art and listen to their glorious singing tone.